Millennia later, the inhospitable planet of Redfern is in the process of being made habitable for the proposed rebirth of the entire human race. All is proceeding as planned until Enforcer, Ted Holloway, witnesses the unexpected appearance of a long dead and former friend – A man who can become invisible and immaterial, a man that can penetrate any and all security. 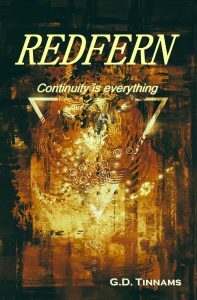 Redfern is an unique kind of book, one that offers an original plot, a solid setting and an intriguing cast of characters, all combined in one. Once I started reading, I couldn’t put it down. The book takes place several millennia in the future. Machines have taken over, mankind was cast out. Now, the inhospitable planet Redfern is being made habitable for the proposed rebirth of the human race. All is going well, but then a security breach occurs – Terraform Control spotted an intruder in one of the domes, a ghostly man who can walk through the Terries. A man who Ted recognizes, although it’s impossible, far beyond impossible even. Ted and his superior, Lisa Carmichael, investigate further, but the more they find out, the more danger they find themselves in, and the more secrets they uncover that could change just about anything. Ted Holloway and Lisa Carmichael were both intriguing characters. Lisa in particular was witty, intelligent, and had a strong personality. All the characters were well developed, even the secondary ones like Jason and Shandra, and they all added to the plot. I don’t want to spoil things, but this book went in directions I never saw coming, and continuously kept me on the edge of my seat.